Here is a version of the tibit game with two players, called “trickster” and “webster”. The webster is the first player. The trickster is the second player. it may have free arrows, i.e. ones with free tail or free tip. Tokens. 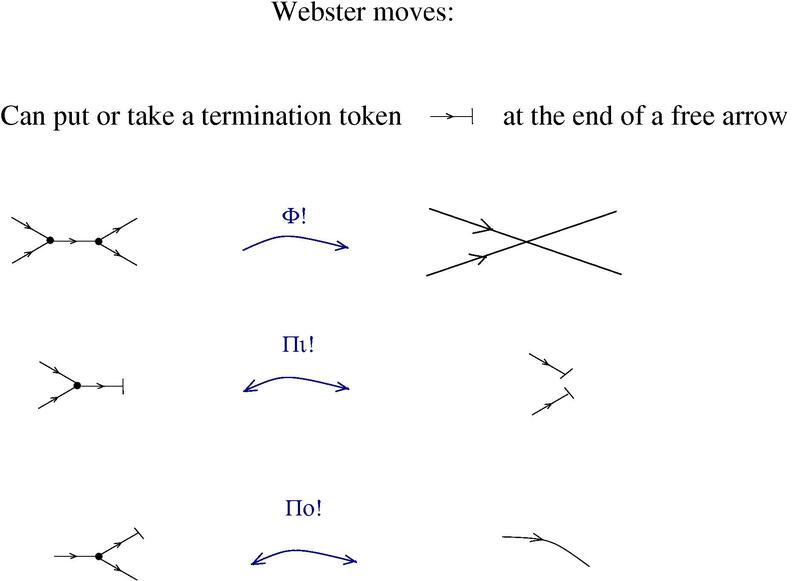 The webster has one type of token, called a “termination token”. 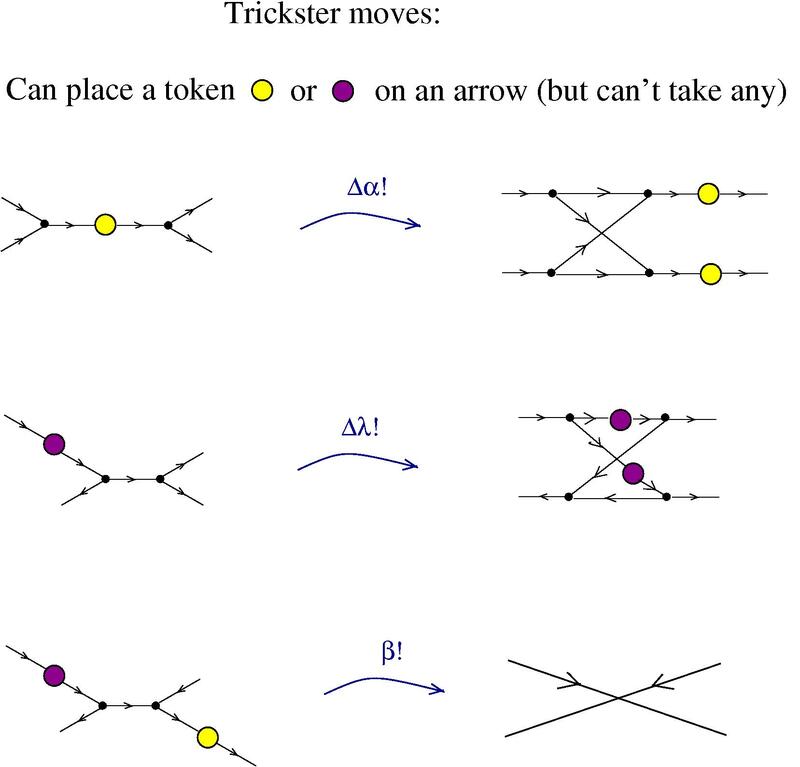 The trickster has two types of tokens, one yellow, another magenta. Moves. When his turn comes, any player can do one of the moves listed further, or he may choose to pass. Some of the webster moves are “reversible”, meaning that the webster may do them in both direction. Let’s say that the “+” direction is the one from left to right in the graphical moves and also means that the webster may put a termination token (but not take one). The “-” direction is from right to left in the graphical moves and also means that the webster may take a termination token (but not put one). The loop rule. It is possible that, after a move by one of the players, the web is no longer a trivalent graph, because a loop (an arrow which closes itself, without any node or token on it) appears. In such a case the loop is erased before the next move. This is a collaborative game. 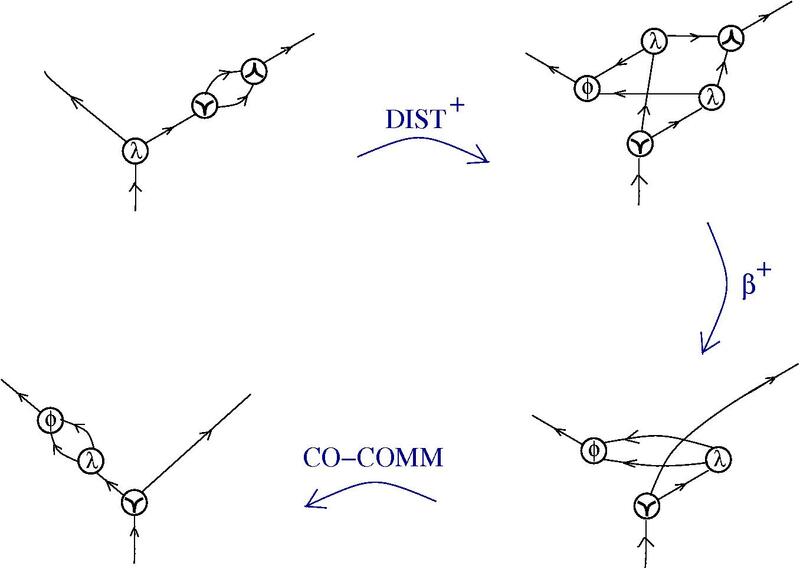 There are two webs, with tokens on them, the first called the “datum” and the second called the “goal”. The players have to modify the datum into the goal, by playing collaboratively, in the following way. The game has two parts. Preparation. The players start from a given web with given tokens placed on it (called the “datum”). Further, the webster builds a web which contains the datum and the trickster places tokens on it, but nowhere in the datum . Eventually they obtain a larger web which contains the datum. Alternatively, the players may choose an initial web, with tokens on it, which contains the datum. Play. Now the webster can do only the “+” moves and the trickster can’t put any token on the web. The players try to obtain a web, with tokens on it, which contains the goal by using their other moves. This is a new thread, anybody wants to contribute to make a multiplayer game, which is also an exploration tool? Will update in the next few days, bookmark the link! UPDATE: “Tibit” is better, thanks Louis Kauffman! This one looks like a bit, but wait, what’s the other one, a hobbit? I shall use chemlambda in this post. To make it more readable for those who are used with GLC, I shall change the notations from chemlambda, as described in the first figure. The node is the fan-in node, which replaces the dilation node from GLC. The (composite) move PROP has been used before. 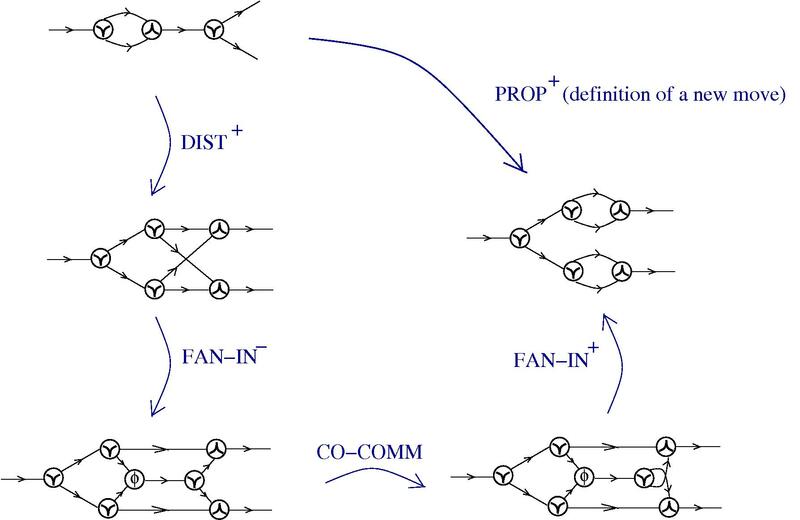 Let me recall that PROP is needed for making the graph of the combinator W to self-replicate. 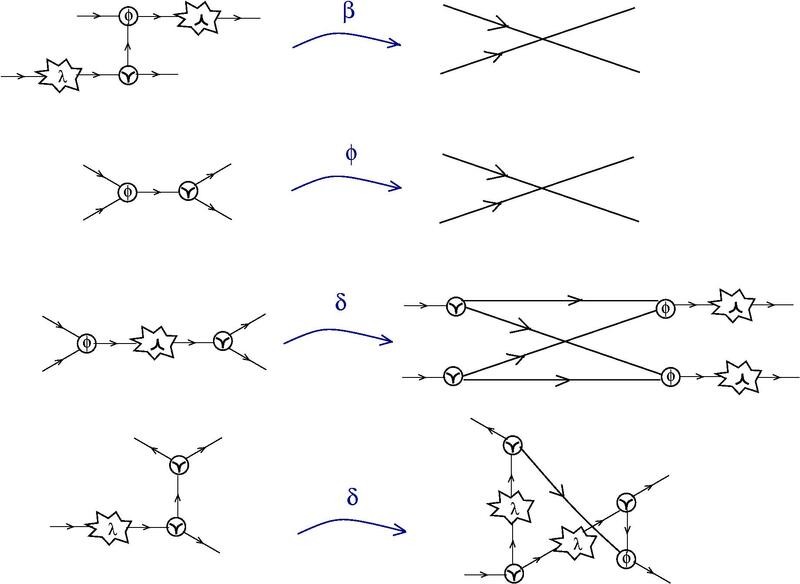 There is a whole discussion about whether is reasonable to have all moves reversible. The conclusion, for chemlambda, is that if we want chemlambda to be Turing universal, then we need only the “+” moves, supplemented by the PROP+ move. Of course that chemlambda is TURING universal if we can use all moves, but using PROP+ instead of using FAN-IN- seems like a reasonable idea. 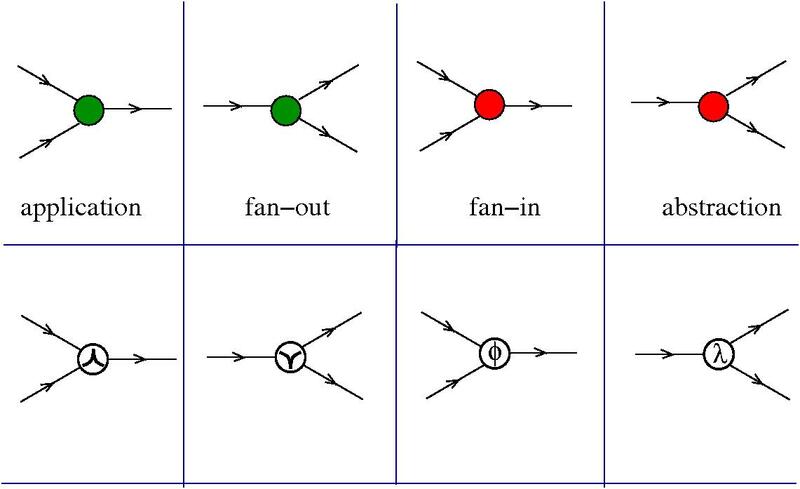 In this second figure we see that the “bit” from the left of the first graph, when grafted to the “in” arrow of a fan-out node, comes out by the out arrows of the fan-out node. 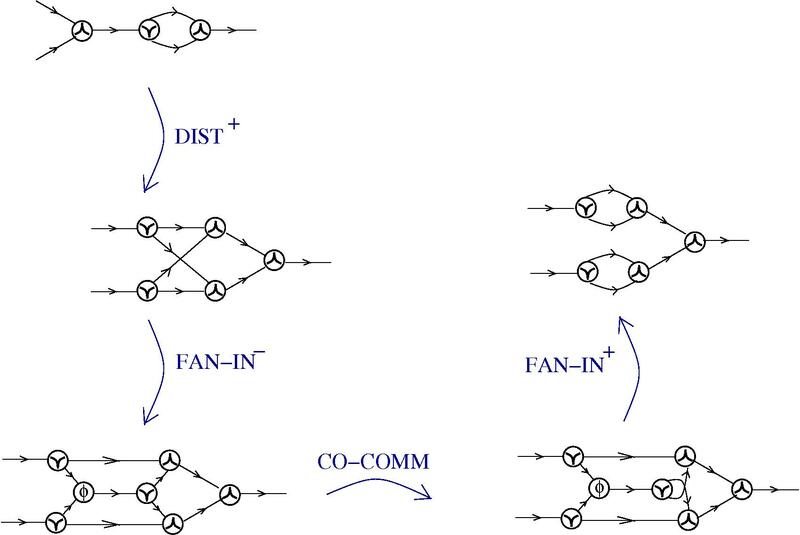 Behaves like a bit, only that there is only an appearance of a “signal” which circulates through the “wires” (i.e. arrows). A strange thing happens if we graft it to the right out arrow of a lambda abstraction node. Wait! 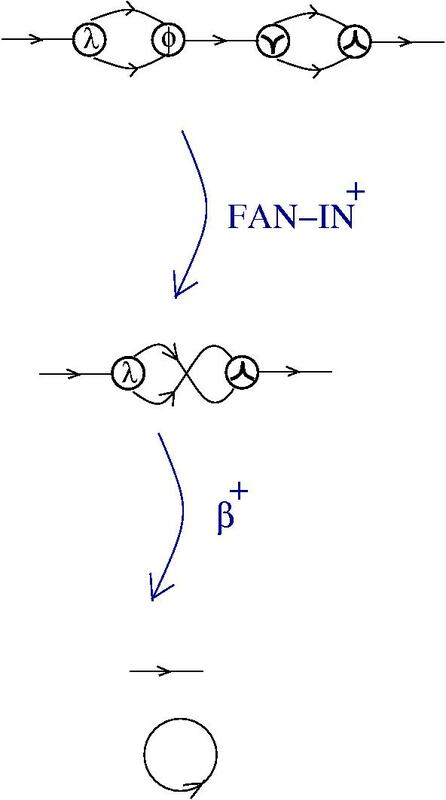 What’s that at the left out arrow … of the fan-out node? A co-bit? A hobbit? First, let us notice that this time we used only “+” moves, that’s very good. Then, it looks like that we lost the lambda node, which transformed magically into a fan-out node, and the bit transformed into the hobbit. Hobbit, or better co-bit? The next figure show that a hobbit and a bit annihilate and produce a loop. Is the hobbit a co-bit?